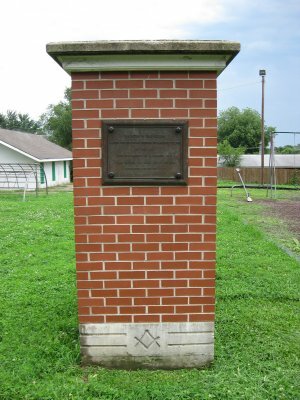 Directions: A replica of the Masonic College classroom building [ Waypoint = N39 11.392 W93 52.571 ] is located in College Park [ Waypoint = N39 11.354 W93 52.573 ] at the corner of State and 16th Streets in Lexington, Missouri 64067. From the house at 700 17th Street head south on 17th Street. 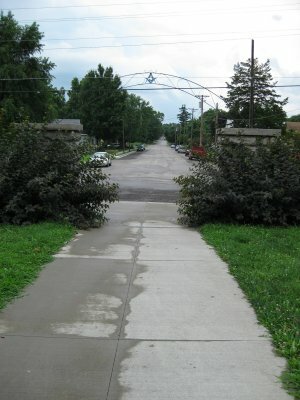 Proceed about 0.4 miles and turn right (west) onto State Street. Proceed one blocks to 16th Street. Stop and find a place to park. College Park is on the right at the north end of 16th Street. Description: In College Park there is a one third sized replica of the Masonic College building that was used as the Union Headquarters during the siege in September 1861. "Site of Headquarters of Colonel James A. Mulligan during Battle of Lexington September 18, 19, 20, 1861. 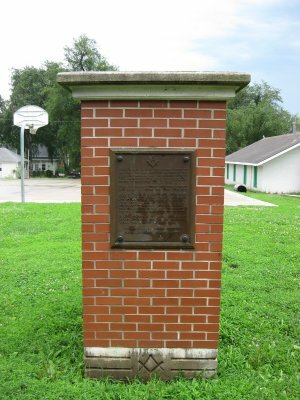 Erected by Lafayette-Lexington Chapter D.A.R. and citizens of Lexington 1928." The original Masonic College was built in 1848, having been relocated from Philadelphia, Missouri. It was a college that was intended to be used by the children of Missouri Masons. Financially, it was not viable and went out of business in 1857. When the Federals arrived in Lexington, they quickly realized that, being located on the high ground, the Masonic College was the best place to defend themselves. When Union Colonel T. A. Marshall took command, he selected the main building as his headquarters It was unoccupied and three stories tall and nearby was a dormitory. About 400 yards downhill to the west, was the Oliver Anderson House. Upon his arrival and assumption of command, Union Colonel James A. Mulligan reaffirmed the selection of the Masonic College Building as his headquarters. During the siege and ensuing battle, the Masonic College Building became the focus of the bombardment by the Missouri State Guard batteries. For a description of a key event involving the Masonic College Building, link over to the Clark's Battery tour stop. 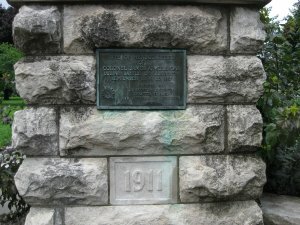 "The stone in this column capped the southeast corner of Masonic College on this site and was broken by a cannon ball fired during the Siege of Lexington September 12th to 20th, 1861." 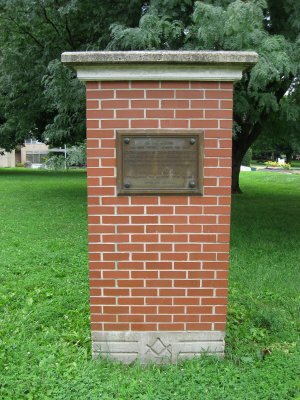 "Here on May 18, 1847, the Grand Lodge of the Ancient Free and Accepted Masons of the State of Missouri laid the corner stone of the Masonic College of Missouri which it dedicated July 11, 1848. Here the Grand Lodge provided higher education for young men until June, 1859. 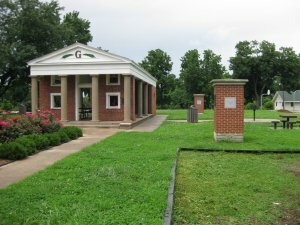 Here by virtue of a gratuitous conveyance from the Grand Lodge higher education for young women was made possible until June, 1925; and by virtue of a like conveyance of March 19, 1828, this memorial park was assured to the City of Lexington for the perpetual enjoyment of the public. In commemoration of these services, the Grand Lodge has erected this memorial tablet, this 18th day of May, 1954. " "On this ground the Blue fought against the Gray. Colonel James A. Mulligan occupied Masonic College as Federal headquarters during the Siege and Battle of Lexington which culminated in his surrender to General Sterling Price commanding the Missouri State Guard September 20, 1861."